A bag of popcorn with two tickets to Star Wars VII: The Force Awakens and 3-D glasses on top. 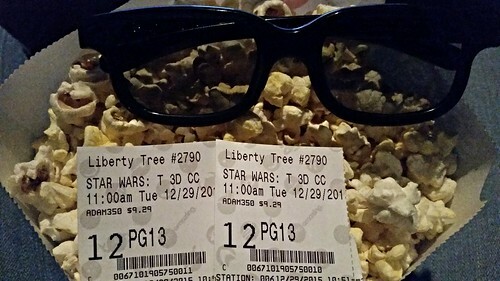 I made it until December 29, a full 11 days after the film's release because I saw the new Star Wars film for my first time. I am a huge Star Wars fan--probably the biggest among my friends, having seen all the films (even the Holiday Special), and read, easily more than 50 of the novels that have come out and close to 100 of the graphic novels that have come out that are all about Star Wars. It's been my thing for decades. So my delay wasn't because I didn't want to see it. I was super-impressed that people were totally respectful with spoilers on social media, hinting at nothing but merely stating to what degree they enjoyed it. But I finally took the plunge on Tuesday. My avoidance was because I just wanted to sit and focus on the movie--to enjoy it to its fullest with as little distraction as possible. So I wanted to wait until the crowds fully cleared so I could just enjoy the film. And yes, I did enjoy it. I have some critiques as I always will of things I'm invested in, but I enjoyed the film on the whole.